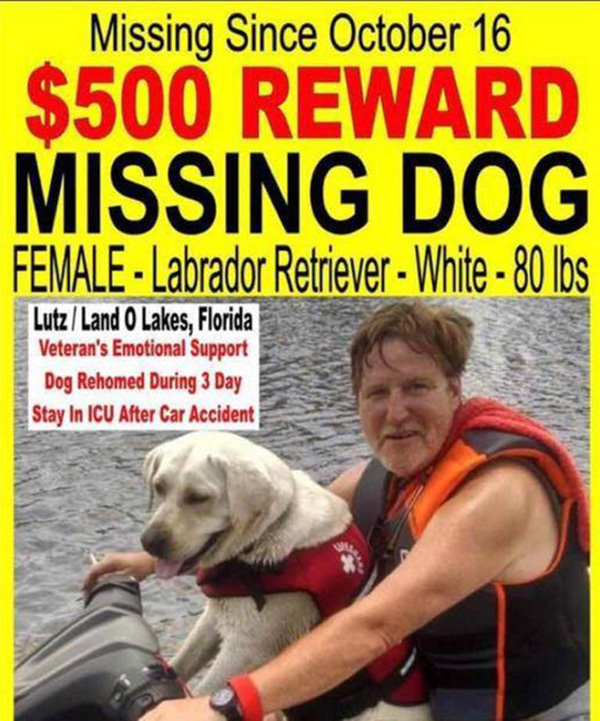 An Air Force Veteran from Land O’ Lakes, Florida, was reunited with his best friend after his lab went missing for 22 days. Larry Peteet, who suffers from PTSD, lost his emotional support dog after he was admitted to the hospital after a car accident. Sandy Girl was in the car at the time. But before he left the accident scene in an ambulance, a first responder asked him what he wanted them to do with his dog. Peteet asked them to deliver her to a specific neighbor. Peteet spent three days in the hospital. When he got out, Sandy Girl was nowhere to be found. “When it first happened, it was all I could do to not freak out and lose my mind,” he explained. “She’s my baby girl, the love of my life. Peteet said he was shocked to learn that his neighbor did not have his dog. He checked the local shelters but Sandy was nowhere to be found. Peteet reached out to the Pasco County Sheriff’s Office. A deputy responded and interviewed several of Peteet’s neighbors, eventually learning that another neighbor had asked someone at a local dog park to watch Sandy because he had to fly to California. So, Peteet hired Fort Lauderdale pet detective Jamie Katz. But after 22 days without Sandy, Peteet was losing hope. Then the phone rang. A man contacted Katz to say he had Sandy. He was told she’d been abandoned and agreed to take her in.